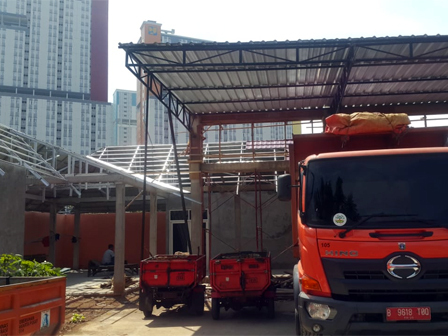 Waste Processing Facility (TPS) construction that located in front of Wisma Atlet, Kebon Kosong Urban Village, Kemayoran, Central Jakarta has reached 90 percent. This construction is targeted to complete within two weeks ahead.
" It remains 10 percent left or about two weeks to complete and it will be ready to operate"
"It remains 10 percent left or about two weeks to complete and it will be ready to operate," mentioned Marsigit, Head of Central Jakarta Environment Sub-dept., Thursday (6/21). According to him, the remaining 10 percent consists of roof installation and finishing. While waste collecting in Kemayoran Sub-district or depot is still running normally by transporting the waste at night. "Later on, it is planned to accommodate around 280 cubic meters waste and it will process waste from four urban villages in Kemayoran and Wisma Atlet only when it holds some certain events," he informed. After the construction is done, this depot's name will be changed into Waste Processing Facility as its function. This facility will be equipped with composting process and waste bank similar to TPS in Gelora Bung Karno and Sunter area.